Trina Turk "Fiji" caftan in floral-print. Caroline Rose easy-fitting, caftan-style top in palm-printed georgette. Attached tank in cool-knit jersey. Scoop neckline. Short, draped sleeves. Flattering side-fall detail. Easy, relaxed silhouette. Below-hip hem. Pullover style. Viscose. Polyester/spandex lining. Dry clean. Made in USA of imported material. Emilio Pucci kaftan in multicolor print. Bateau neckline. Long sleeves. Relaxed fit. Ankle-length. Handkerchief hem; split sides. Slipover style. Cotton. Emilio Pucci kaftan in multicolor print. Bateau neckline. Long sleeves. Relaxed fit. Ankle-length. Handkerchief hem; split sides. Slipover style. Cotton. Made in Italy. Model's measurements: Height 5'10"/177cm, bust 33"/84cm, waist 25.6"/65.2cm, hips 35.8"/91cm, dress size US 2-4/FR 34-36. Etro coverup caftan with ruffle trim. V neckline; tassel ties. Long sleeves. Cold shoulders. Slipover style Cotton; ribbon, viscose/cotton. Made in Italy. Model's measurements: Height 5'10"/177cm, bust 32"/81cm, waist 24"/61cm, hips 35"88cm, dress size US 2/4. 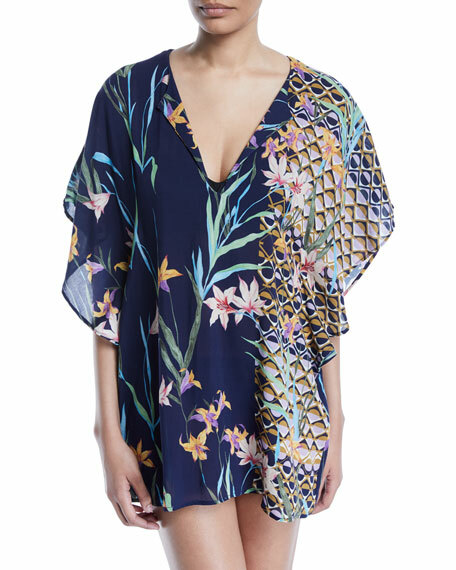 La Costa Del Algodon "Hydra" caftan in floral-print. Spread collar; hidden button front. Long sleeves. Relaxed silhouette. Layered hem. Cotton. 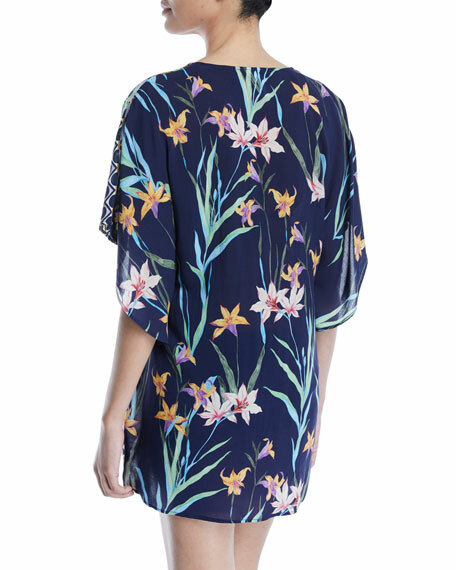 La Costa Del Algodon "Hydra" caftan in floral-print. Spread collar; hidden button front. Long sleeves. Relaxed silhouette. Layered hem. Cotton. Made in Portugal. Model's measurements: Height 5'10"/177cm, bust 33"/84cm, waist 25.6"/65.2cm, hips 35.8"/91cm, dress size US 2-4/FR 34-36.